By now, we’re all familiar with music industry narratives about an artist battling with his/her label for creative control. It’s a common frustration that unites alt-rockers like Juliana Hatfield and pop stars like Kelly Clarkson. But this time, the rejection wasn’t because an executive “didn’t hear a hit” or failed to see sales potential. When fellow EDM producer ZEDD inquired as to the reason, Raddon replied that the issue was that Atmosphere wouldn’t ”land me beer commercials and movie singles.” Although the album was ultimately released, the label relationship apparently did not survive. It’s no secret that sales of CDs have declined and downloads and streams haven’t entirely made up the difference. This means “sync” placements in commercials, film and television have been growing in importance. Ultimately, it’s a good thing whenever artists are getting paid. But for a subculture that historically has emphasized freedom and sonic adventurousness, it may be alarming to hear that labels are making creative decisions guided more by the music’s value to potential advertisers than by its value to fans or the intentions of the artists themselves. For years, soul-shaking, bass-dropping and brain-scattering electronic sounds have gone beyond the margins to reach the masses. Still, many artists emphasize keeping the culture of electronic music focused on the relationship between DJs and fans. 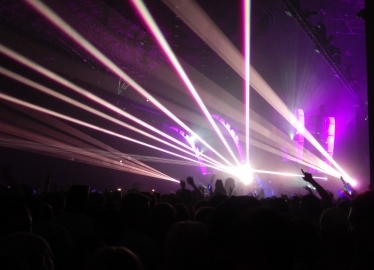 As its popularity has grown, however, EDM has become increasingly attractive to Wall Street (as we explained in a 2012 blog post), and huge corporations are taking notice… and taking over. The last few years has seen EDM promoters, arenas, festivals, labels, publishers and ticketing outfits being bought up by bigger companies seeking to capitalize on the electronic boom. Fans may not like the results of this consolidation. SFX Entertainment, run by Robert Sillerman—best known as the founder of the company that ultimately became Live Nation—has been rapidly acquiring major promoters and festivals, including Electric Zoo and Europe’s Tomorrowland festival (for $102 million), as well as the digital music store Beatport. But since the company went public in October 2013, there’s a new challenge to bring returns to shareholders, and consolidation hasn’t yet translated to profitability. Ben Sisario of the New York Times reports that last year SFX it had $170 million in revenue and a net loss of $119 million. It plans to make up for revenue shortfalls with a plethora of corporate sponsorships (including Anheuser Busch) and media partners, most notably broadcasting behemoth Clear Channel. In short, festivalgoers had better be prepared to see a lot more corporate sponsorship at their favorite events. Nonetheless, the consolidation continues. Mega-production company AEG Live, manager of many venues, arenas, promoters and Live Nation’s closest competitor recently bought out Madison House Presents, the Boulder, CO-based company responsible for Electric Forest, a growing festival in Rothberry Michigan, among others. To be clear, we’re excited whenever artists are paid, and to the extent that the EDM’s growth is making this happen, it’s worth celebrating. But the financials can be more precarious than many assume. Producer Nick Thayer, signed to Skrillex’s OWLSA imprint (a Warner subsidiary) recently broke down his recorded and live music income in an enlightening post. “The value of something that is just given away for free is never the same of that which is earned… and that is kind of the conversation that I have been having with myself for the last few days,” Kaskade said on his Twitter account. He has decided to give away his new single for free while he figures out what to do next. “I continue to create and write music cause that is what I do,” he assures his fans. There are many other EDM artists that have employed direct-to-fan strategies to combat corporate control. Derek Vincent Smith, best known as Pretty Lights, has bypassed the issue of corporate ownership by starting his own label and releasing music by his electronic music “family” including Paul Basic, Gramatik, Michal Menert and more. The music is made available for free download in exchange for email addresses which can be used to promote live dates, which frequently sell out. But it’s important to consider the clear limits to this approach. It won’t work for every artist, even in the EDM genre, especially if complicated financial relationships between artist management, promoters, labels, and media partners like Clear Channel lead to more and more gatekeeping practices. Submitted by Anonymous (not verified) on January 10, 2015 - 8:44pm. This was a really insightful and informative article on labels within the EDM scene. I never really gave it much thought as to what goes on behind the scenes with labels and such. Thanks for the info! If you are interested in beat-making for EDM, check out some great info.